J.W. Ironside, T.H. Moss, D.N. Louis, J.S. Lowe, and R.O. Weller, eds. New York: Churchill Livingstone; 2002, 664 pages, 800 illustrations, $269. In this beautifully crafted textbook, the editors and authors have presented, in a visually pleasing, highly readable, and informative format, the gross and histologic features of central nervous system (CNS) tumors. There is, however, more to this book than the pathology per se; the authors have correlated many key clinical, genetic, and imaging features with the pathology, so this book will be intensely interesting to the neuroradiologist. Here is how the book is set up. There are 20 chapters, and the major portion of the book (chapters 4–20) deal with the major categories of tumors, namely, astrocytic tumors, oligodendrogliomas, ependymal and choroid plexus tumors, embryonal tumors, neuronal tumors, pineal tumors, germ cell tumors, lymphoreticular neoplasms, metastasis, meningiomas, vascular/melanocytic/soft tissue tumors, peripheral nerve tumors, pituitary fossa tumors, cysts/tumor-like lesions, extension from adjacent tumors, dysgenetic syndromes, and complications of tumors/effects of treatment. The fact that the entire book is written just by 5 authors (that is, there is not the usual host of contributors) gives the book a uniform appearance and high level of consistency throughout. 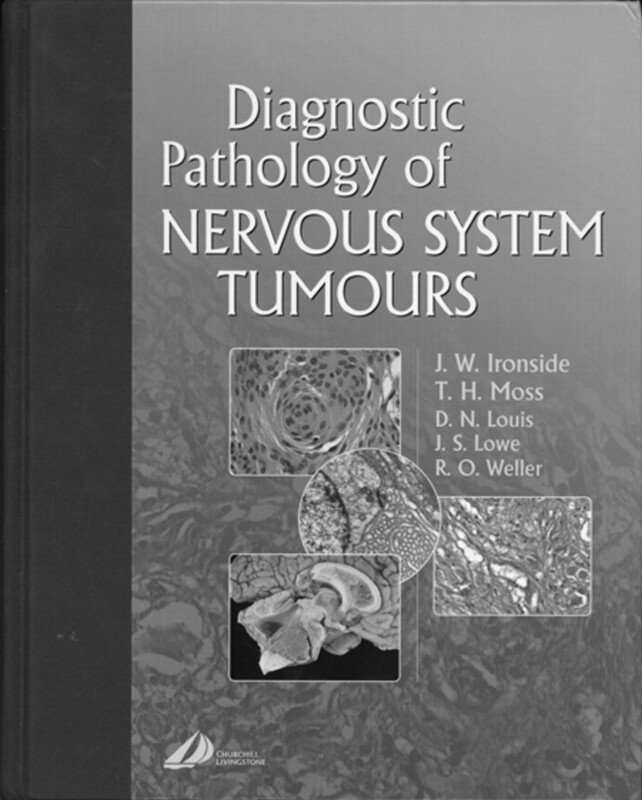 The first 3 chapters (“Introduction to CNS Tumors”; “Practical Approach to the Diagnosis of Neurosurgical Biopsies”; “Intraoperative Diagnosis”) contain information that all neuroradiologists will find useful. As just a couple of examples there are, in tabular presentations, descriptions of the major molecular assays used in cancer diagnosis: DNA analysis, RNA analysis, and protein analysis, polymerase chain reaction, and more; the different color stains, (Masson-Fontana, Luxol blue, periodic-acid-Schiff, van Gieson, and so forth) and what they demonstrate, and antibodies used in diagnosing various types of tumors. Not only should this type of basic information be required reading for all neuroradiologists, but many would want to copy some of these tables and have them “at the ready” when reading journal articles, reviewing papers, or presenting radiology/pathology correlations at conferences. For those interested in a summary of what are often arcane terms in the electron microscopy of tumors (such as, desmosones, annulate lamellae, microtubular sheaves, Birbeck granules), there are explanations and excellent images of these and other more commonly encountered electron microscopic structures in these early chapters. With the above as the overall construction of the book, the question arises: How is it useful for the neuroradiologist? The answer is that the authors describe many of the issues and pathology information we face in our daily practice but about which many neuroradiologists have less than a full understanding. Although the authors attempt to bring some neuroimaging into the book, the imaging itself is no more than a brief survey in each chapter. One would have liked to have seen correlated imaging of each of the pathologic entities described—perhaps in a future edition the authors will expand that part of the text—but to this reviewer this limited amount of imaging is acceptable because such illustrations were not intended to be a significant part of the book. In fact, in the radiology parts of some chapters, the descriptions of the imaging are clearly introductory, because the findings are described in a manner that would apply to someone who was not significantly involved in CT and MR interpretation (eg, “black areas” or “white spots” on CT or “white areas” on MR). That is easily forgiven because the remainder of the book is so informative. Beautiful histopathology along with gross pathology specimens (all in sparkling color), along with a number of electron microscopy sections are abundant throughout. The publisher certainly did not skimp on the use of color, and such usage vividly makes the pathology points stick with the reader. A few examples will hopefully suffice to describe the value of this book, but this reviewer emphasizes the need for any potential buyer to actually look through the book to fully appreciate its astonishing visual impact. In the chapter on astrocytic tumors, there is at first a description of astrocytes, normal, reactive, and tumoral, which lays the histologic ground works for what follows. Here the authors begin by stressing basic cellular considerations of astrocytes, from their embryologic beginnings to their mature forms. One reads about the common astrocytes (protoplasmic and fibrous) and the specialized astrocytes (tanocytes and Bergman glia), their function, their role in metabolism, and their staining characteristics. Following this basic information, the epidemiology, incidence, WHO classification, and genetic considerations of astrocytomas are followed by a discussion of each individual subtype of astrocytoma. For example, under pilocytic astrocytoma the incidence, clinical features, and radiology are described and illustrated. Here one sees all the histologic features of the typical pilocytic astrocytomas (the hairlike pilocytic processes, deposits of Rosenthal fibers, typical tumor vasculature) and the histologic differences in the variations of pilocytic astrocytomas (diffuse, anaplastic, pilomyxoid astrocytoma). It is important to note that the authors stress the differential diagnosis from a histopathologic point of view (including medulloblastoma, ependymoma, ganglioglioma, hemangioblastoma, and metastasis). Later in this chapter, when dealing with diffuse astrocytic tumors, the authors go through the differential diagnosis for non-neoplastic processes, which often masquerade as these tumor types. In particular, there are complete descriptions of that frequently encountered entity “reactive gliosis,” along with acute multiple sclerosis, progressive multifocal leukoencephalopathy, infarction abscess, and radiation. Nearly all neuroradiologists have encountered situations in which a suspected tumor has turned out to be one of the above lesions. By reading this section, one learns the potential difficulties the pathologist may have in separating these lesions. As stated in the book, “A high percentage of major misdiagnoses detected in neuropathology consultation practices are non-neoplastic cerebral conditions that have been diagnosed as neuroepithelial tumors.” There is of course a discussion of other neoplasms that enter into the differential diagnosis of diffuse astrocytomas. As an aside, the references are highly useful; for instance, instead of listing all 273 citations together, they are subdivided according to the specific topic within that chapter. This brief description of the chapter on astrocytic tumors serves to give the reader of this review an idea how all the subsequent chapters are written. The detailing of information on each tumor and tumor-like condition follow in general the pattern of presentation as described above for astrocytic tumors. What specific parts of the book were found to be of most interest to this reviewer? The histopathology of certain lesions, for example, gliomatosis cerebri, subependymoma, dysembryoplastic neuroepithelial tumors, paragangliomas, dysplastic cerebellar gangliocytoma (Lhermitte-Duclos), tuberous sclerosis, malignant fibrous histiocytomas; differentiation of tumors by their immunocytochemistry features; meningiomas and their variants/mimickers such as meningioangiomatosis, hemangiopericytomas, and arachnoid hyperplasic (overlying a glial tumor fibrous tissue tumor); peripheral nerve tumors with all the variants of Schwannomas and neurofibromas, such as nerve sheath myxonas, malignant peripheral nerve sheath tumors, granular cell tumors; the pathology of various primary cystic lesions such as enterogenous cysts, epidermoid cyst (the authors incidentally mistakenly call the hyperintense signal intensity on a T2-weighted image similar to fat when the fat in other areas of the scan are isointense), dermoid cyst, colloid cyst, neuroglial cysts, craniopharyngioma, perineural cysts, pineal cysts; tumor-like abnormalities such as heterotopias, hamartomas, lipomas, nasal glial heterotopia, and the various vascular malformations; and the inherited malformative syndromes such as tuberous sclerosis, neurofibromatosis 1/neurofibromatosis 2, von Hippel-Lindau, and Sturge-Weber. In comparison with what many would consider the gold standard in this field, Russell and Rubinstein’s Pathology of Tumors of the Nervous System, this text is vastly preferred. The widespread use of summary tables, the exquisite color reproductions on high-quality paper, the divisions of the chapters into well-defined subheadings, and the straightforward descriptive material elevate this book into the “must-have” category for any neuroradiologist. The next time you attend a major medical meeting, make it a point to visit publisher’s row, seek out this book, and judge the quality of information yourself. You will be impressed. Of all the nonimaging textbooks on this reviewer’s bookshelf, this volume, along with Neurology in Clinical Practice, is the most valued. It is recommended in the strongest terms.